Packed with more than 800 vivid full-color photographs of more than 130 varieties of cut and uncut stones, organic gemstones, and precious metals, this concise guide combines its stunning visuals with a systematic approach that enables you to recognize each gemstone instantly. Published by Dorling Kindersley in association with the Smithsonian Institution, the guidebook is beautiful, informative, and accessible to readers of all levels. Each expertly written entry combines a precise description with annotated photographs to highlight each gemstone's chief characteristics and distinguishing features. Additional color illustrations and photographs show uncut stones, color variations, and a wide range of popular cuts. Easy-to-use, color-coded bands provide at-a-glance facts for quick reference. Also included is a comprehensive glossary. 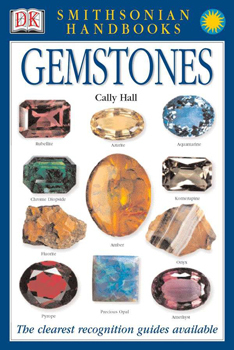 Written by gem expert, writer, and curator Cally Hall of London's Natural History Museum, and packed with detailed information on gemstone properties, varieties, and more, DK's Smithsonian Handbook of Gemstones is the clearest identification to natural and synthetic gemstones for beginners and established enthusiasts alike.